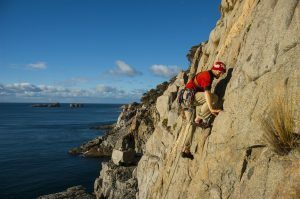 Located at the southern most point of the Tasman Peninsula, Cape Raoul is one of Tasmania's most spectacular 'take your breath away' cliff top walks. Far down south from Hobart, on a peninsula connected by a sandy neck of land no more than 100 metres wide, you'll find the soaring cliffs and roaring waves of Tasman National Park. 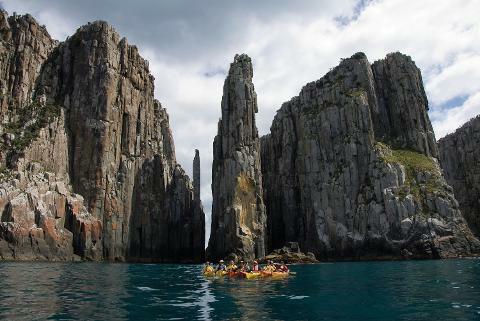 Marked by dolerite seacliffs standing more than 300 meters tall, this national park is home to seals, dolphins, penguins and whales as well as endangered bird species like the Swift Parrot, Wedge-tailed Eagle and Tasmanian Sea Eagle. 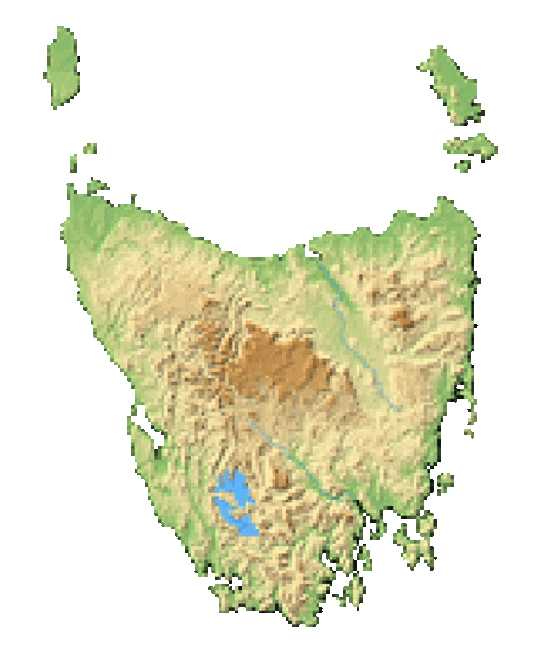 Tasman National Park is a little more than 1.5 hours away from Hobart. 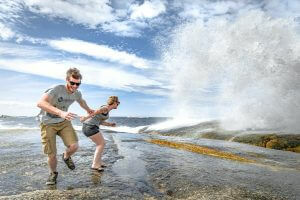 You'll have to first drive west before heading south through some of Tasmania's most beautiful holiday shack towns. Drive through Eaglehawk Neck, a small town built on a narrow sliver of sand no more than 100 metres wide, and marvel at the brutality of Tasmania's past. 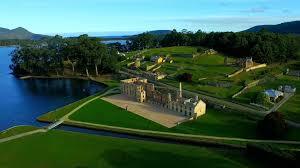 A "Dog Line" of chained aggressive dogs were stationed across this sliver of land to stop convicts from reaching mainland Tasmania from Port Arthur. Then make a pitstop in Doo Town to count the holiday shacks nameplated with the word Doo, like Xanadoo and Doo Drop In. It'll take you a little more than 3.5 hours to drive from Launceston, and Devonport sits a little more than 4 hours to the northwest. Tasman National Park takes up more than 107 km². It is nearly impossible to explore every landscape of this sweeping national park unless you are willing to take the multi-day Three Capes Track. This 46-kilometre trail brings you to every climate zone in the park as well as overlooks at Cape Pillar, Cape Hauy and Cape Raoul. Tasman National Park is for the adventurous. Hang gliding launches over Pirates Bay and lands safely on a designated beach on the Bay. It is the most exhilarating way to catch some of the jaw-dropping coastal views that the park has to offer. Rockclimbing and abseiling are popular activities within the park. Towering sea stacks can be found north of Fortescue Bay. Two sea stacks at Cape Hauy, the Candlestick and the Totem Pole, as well as the cliffs that Mount Brown are also popular climbing destinations. It should be noted that only existing tracks can be used and no bolting is permitted. Walking tracks are carved throughout the park. They range from pleasant and leisurely strolls down to challenging multi-day walks over rugged terrain. The most challenging walk in the park is the Three Capes Track which is 46 kilometers long and takes 3 nights to complete. The Blowhole is one of the many geological attractions in the park. Depending on ocean conditions, pressurized surf shoots through a seacliff rock hole to make a geyser that sprays water meters into the air with every surge. You'll have to descend into Devils Kitchen to catch a glimpse of the Tasman Arch. The kitchen is a rocky bay with frothy surf while the Tasman Arch towers above. A safe walking track brings you around the arch which stands hundreds of feet tall. 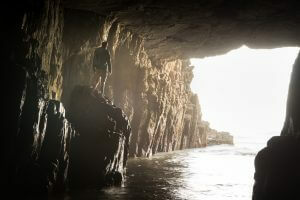 Remarkable Cave is accessible during low tide only. The walk from the beach behind Remarkable Cave begins with a narrow cave entrance that opens up to a larger cavern near the ocean. You'll also find the trailhead to Mount Brown at the Remarkable Cave carpark. This National Park is marked by its columns of dolerite cliffs. Dolerite is a rock that is only found in Australia making this national park one-of-a-kind. The temperature in the park is extremely well regulated. It is generally cool and comfortable during the day and the temperature does not drop much at night. And you can expect a little bit of rain which occurs about every third day. 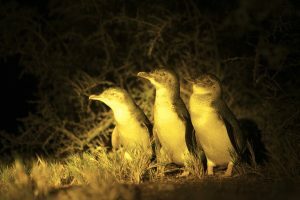 Little penguins, otherwise known as Blue Penguins or Fairy Penguins, nest along the shores here at Tasman National Park. Visitors flocked from all over the world to catch a glimpse of these tiny little sea creatures who enter the water to hunt during the day before returning to their oceanside homes at's desk. Get some binoculars so you can see these cute little birds fight tiny waves to come back to the coast in formations called rafts. And notice how they call out to each other before descending into their sandy subterranean homes. The southern part of the park is protected as an Important Bird Area. Designated by BirdLife International, this protected stretch of land is home to the endangered Swift Parrot, Forty-spotted Pardalote, Wedge-tailed Eagle and Sea Eagle. Tasman National Park is a popular destination so you'll find plenty of accommodations just outside the park. You'll find hotels, bed and breakfasts, hostels and holiday houses for hire starting in nearby Eaglehawk Neck. Fortescue Bay offers up 40 camping sites with amenities. The Regional Forest Agreement (RFA) identified the Tasman National Park as an important conservation area and proclaimed it a national park in 1999. The land came under protection to conserve the beautiful ocean views, dolerite cliffs, endangered bird species and important migratory whale waters.